This monumental fountain sits at the top of Rome’s Janiculum Hill, one of the tallest in the city. Dating from 1612, the ornate terminus of the Acqua Paola aqueduct brought water to Vatican City and Trastevere for the first time. Today, you can admire both the fountain and the view, one of the best in Rome. 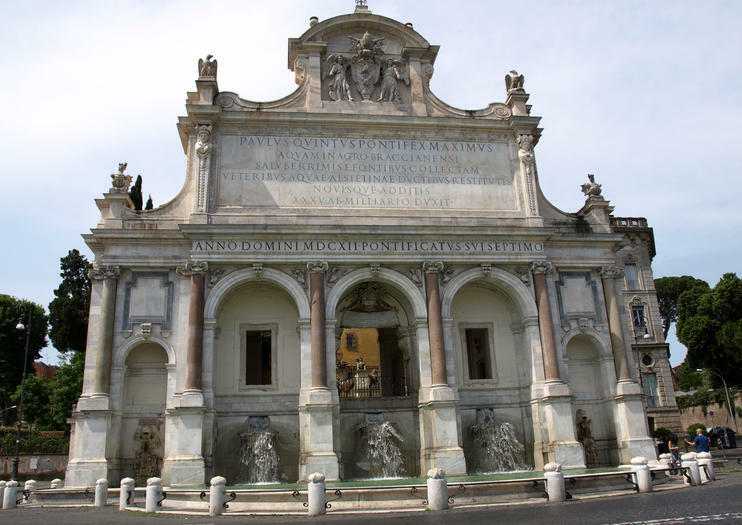 The ornate Fontana dell'Acqua Paola—known in Rome as Il Fontanone, or “the big fountain”—is located on the hilltop above Trastevere and is a highlight of many walking or Segway tours of this charming historic neighborhood. Trastevere pizza-tasting tours also often stop at the Fontana dell'Acqua Paola, as do tours of attractions featured in the film "The Great Beauty." The fountain was commissioned by Pope Paul V to be the first major fountain on the Trastevere side of the Tiber river. Much of the marble used by architect Giovanni Fontana to build the fountain was pilfered from the Roman Temple of Minerva in the Forum of Nerva, and four of the six granite columns on the fountain's facade are from the original St. Peter’s Basilica. The design inspired that of the Trevi Fountain more than a century later. The view from Fontana dell'Acqua Paola stretches across the historic center of Rome to the Roman Forum, so be sure to bring your camera. Walking and Segway tours of Trastevere offer little shade; comfortable shoes, a hat, and sunscreen are recommended. Remember that it is illegal to bathe in Rome's historic fountains. The fountain and scenic terrace are accessible to wheelchairs and strollers. The Fontana dell'Acqua Paola is located on Via Garibaldi on Janiculum Hill (Gianicolo) above the Trastevere neighborhood. Since it can be confusing to wind your way through the back streets of Trastevere to the fountain, it’s best to visit with a group or private tour. Rome is the most popular tourist destination in Italy, which means that its sights can be very crowded in high season. It's best to visit the city in the spring and fall to take advantage of milder temperatures and fewer tourists. If visiting the fountain in summer, time your tour for early morning or late afternoon for the best lighting for photos. Pope Paul V was a member of the Borghese family and you can see the Borghese symbols of the dragon and eagle worked into the marble decorations on the Fontana dell'Acqua Paola. See Rome during dawn’s ‘golden hour’ on a 3-hour sightseeing tour of city’s most iconic sites at first light. Enjoy the Trevi Fountain and Piazza Navona before the daytime heat and crowds arrive, and capture unforgettable images of the landmarks in the early morning. Continue to the Pantheon and St. Peter’s Square, Circus Maximus, the Spanish Steps and the Colosseum. Explore the city alongside a small-group in a luxurious van, with multimedia presentations and an experienced guide. Get a unique look at Vatican City with this private 2.5-hour walking tour with a local guide. Learn about the pope as you stroll through central Rome toward St Peter's Square. Get local insights on life in the Eternal City from your private guide. Sample some pizza and then some wine with one of the city's best sommeliers. Explore historic streets and glide across classic Roman piazzas on a 3.5-hour, guided Segway tour of Trastevere. Immerse yourself in the sights and sounds of a historic neighborhood, and discover exquisite local churches and quiet back roads. See the High Renaissance lines of the Tempietto del Bramante, discover Santa Maria’s glinting mosaics and ride to the top of Janiculum Hill for unmatched views of the city. Hear stories about Rome’s history and culture at every stop, with plenty of time to take pictures and ask questions along the way. Roll through a charming labyrinth of narrow streets and antique piazzas on a 3-hour Segway tour of Rome’s Trastevere neighborhood. Discover the layers of history that have shaped this well-preserved pocket and see its most captivating monuments such as Palazzo Corsini, Teatro Marcello, the l'Acqua Paola fountain and the Basilica of Santa Maria in Trastevere, one of Rome’s oldest churches. Travel much longer distances than you would on a walking tour, and easily scale a hill leading up to the Gianicolo lookout for panoramic Vatican views. Explore the Travestere neighborhood in Rome on a 3.5-hour Segway tour with a knowledgeable guide. Begin with a lesson on operating the Segway, then set off with your guide into the dense tangle of small streets in Travestere. See landmarks including Villa Farnesina, Palazzo Corsini, Basilica di Santa Maria in Trastevere, Fontana dell'Acqua Paola fountain, and Teatro di Marcello, and soak in sweeping views of St Peter's Basilica and the Vatican gardens from the top of Gianicolo Hill. You’ll also stop for tastings at one of the best traditional pizzerias in Rome. In the short time of a Cruise Stop, we will be the show to you, to the middle ages until the Renaissance, to the recent history of Rome and Italy.With our vehicle, we can get really close to most of the sites of interests.In case of more than 8 passengers, we can use more minivans. We create photo shooting of your wedding proposal in Rome.The main feature is the legendary Fiat 500, this magnificent vintage car is the protagonist of our shooting, which will make you have beautiful memories of the beautiful city of Rome.It will be like reliving the years of La Dolce Vita, years of splendor and elegance.If you also want to live with me.We are dog-friendly. During the tour you can visit the beautiful panoramic and hidden place of Rome. Hillside with Orange Garden and "key hole". Gianiculm Hill with "cloister of Bramante" inside the Spanish Academy and the incredible most beautiful view of Rome.This is a unique panoramically tour.During tour you can stop for the best ice cream, coffe, or any other place with you!